This weekend I have been working with some member of the Austrian Alpine Club who signed up for a winter skills weekend. Our group had a wide variety of experience covering 2 or 3 generations and a variety of mountaineering experience. To optimise to teaching time and skills we opted for some mechanical assistance and got the gondola up to Aonach Mor, bringing us out in the snow. As the weather was more desirable we opted for more of a journey and to get up high, so armed with the appropriate skills we set off for the summit station. Unfortunately, time evaporated and we didn't make it to the true summit, sometimes the case when there is lots to teach. We made our way back down avoiding all the pistes and back to the comfort of the gondola to save some knees. Day 2 there was a strong desire to make use of the mechanical uplift again however the strong wind's didn't allow and the gondola was off all day. So instead we opted for a drive over to Glencoe and headed up Coire na Tulaich on Buachaille Etive Mor to pick up where we left off. As the winds were high today we stayed sheltered and opted for a more static skills based day covering any aspects we didn't have time for yesterday and equipped the team with enough tools in their tool boxes to go out and have a save and fun day in the hills. The team were great sports and put great effort into everything, Mike put in a great effort trying to break the sound barrier on his ice axe arrest runs and I was very thankful of the Sloe Gin from their hip flask at the end of the day. A great couple of days and the weather wasn't too bad either. Steve sporting equipment older than me. Steve's wooden Stubai axe. Lovely piece of equipment. Working as an independent MIC it is great to have opportunities to further my knowledge and understanding with a group of other independent providers and hill enthusiasts. The day was put together by the Chris Walker Memorial Trust. This charity provides funding for expeditions to greater ranges and also helps mountaineering instructors to attend courses to further their knowledge and understanding, helping avoid further incidents and pass on crucial information to clients. The day was split into two, we had a classroom morning looking at the theory of avalanche awareness and how we can teach this to our clients, followed by a hill based afternoon showing how we can utilise the mountains and teach clients exactly what they need to know. 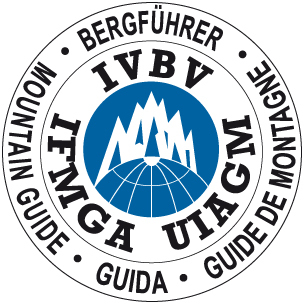 As a member of the Association Mountaineering Instructors (AMI) it is important that we attend these CPD courses to make sure we stay current and in-line with modern ideas and thinking. A fantastic day ran by Graham Moss from the SAIS. Smoking the White Owl - Yuk! Back out with Alan today who has had a good old rest after our day out on Monday. Blue skies, cold temperatures and light winds was what everyone in Lochaber woke up to. It was great to be out climbing a frozen waterfall. I have never climbed this well talked about route. Named 'Smoking the White Owl' (IV,4), it was a great route on water ice which had some really good climbing and some tricky pitches. Last week I heard that there were 10 teams on the route which would have been carnage, on arrival to the climb we had the whole place to ourselves and after a pitch, Al and his client turned up to make the most of the accessible ice route. It didn't take long to climb the route so Alan and I enjoyed lunch at the gondola station watching all the skiers work their magic The pistes look brilliant and they were pretty much deserted. Many 'Saga' members around who have got the Gondola up for the 'mountain experience'. I over heard one phone call where they were saying that they were half way up Ben Nevis....I didn't break the bad news to them but it was tempting! More blue skies, minimal winds and amazing ice routes to climb tomorrow. I think its going to be busy in the mountains over Easter! Today John and I froze our fingers off on the chair lift at Aonach Mor. The pain was worth it as we were able to rest our legs a little bit by having a shorter 'walk in' day. Johns third day on was all about ice. We met Rich and his team at the bottom who were planning Right Twin. That was good so we still had plan A all to ourselves We were psyched for Left Twin (III,4). Then, out of nowhere like some stealth giraffe, Mike strolled past us with sharp elbows and went for our chosen route! All in good humour though. Mike decided to abseil down the route so we decided to zip down Easy Gully and check out the rest of the routes. This would give Mike a chance to get up a pitch. So John and I built a snow bollard and abseiled in to find plenty of snow which was stable where we walked/waded. There was plenty of ice forming on the Ribbed walls, nothing steep was quite there such as White Shark and Aquafresh but the mixed routes looked good. Left Twin was in great condition with Siamese Twin nearly there. There was a team on Stirling Bridge and I think that was it. John led the last pitch up to the cornice via a nice little mixed step which Mike and his client put tracks through. A fantastic day followed by some great soup and coffee in the cafe.